Beautiful perennial, bearing pink white striped hooded flowers in June, followed by large green leaves. For fertile soils in part shade. 40cm. high. Glossy dark evergreen leaves eventually form a neat, compact, dense weed-proof carpet. Unobtrusive brown flower in early summer. Prefers a shady spot. 10cm. high. Collection of 6 Asters £30 + p&p. Asters are indispensable for prolonging colour in the border well into Autumn, and make excellent cut flowers. Easy and vigorous plants, to grow in sun or part shade. Enter 6 (or more) in Qty box. Very vivid violet-blue single flowers on upright stems. Mound forming, compact and very floriferous from early September. Excellent new cultivar from a breeding programme in Holland. 50-60cm. high. A mass of tiny white flowers with prominent yellow centres on bushy upright plants. Invaluable for autumn display. 45cm. tall. Very floriferous variety producing an absolute mass of tiny single mid-pink stars. End September to end November. 90cm. high. 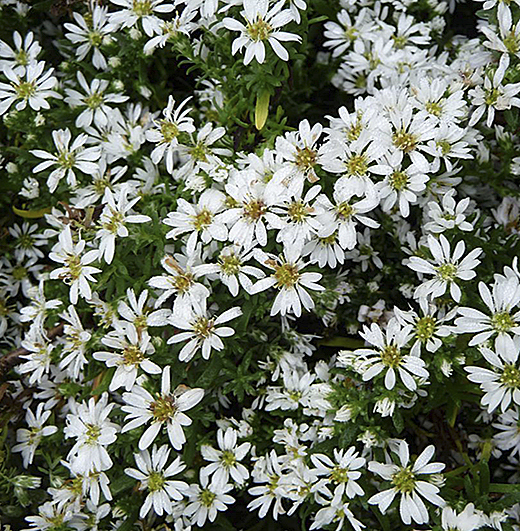 Spreading prostrate form with masses of tiny white flowers in September to October. Ideal cascading over a wall or in a big pot. 15cm. high to 70cm across. Lavender-blue daisies with yellow centres, July to early autumn. Sun or part shade 100cm. high.